The 2018 Texas College Soccer season is underway this weekend. College Soccer programs (both 4-year and Community Colleges) generally play a compressed 15-20 game regular season that begins this weekend and ends in late October. Conference and National playoffs, in the respective governing organizations (e.g., NCAA, NAIA), are concluded by early December. Some universities, especially in Division I and II, also play abbreviated spring exhibition schedules. In simplistic terms, the first serious organized soccer leagues in the country originated in Northeast universities more than 100 years ago. College soccer also has a history in Texas that extends much further back than any professional league in the State. In his 2011 book Distant Corners, David Wangerin wrote about early attempts to establish the sport in Texas universities and others around the country. SMU, Baylor and the University of Texas had soccer programs as far back as 1913. These early Texas soccer programs, largely created and played by immigrants, were unable to gain traction and disappeared shortly thereafter. After United States professional soccer essentially went into hibernation in the 1930’s, except in isolated pockets of the country, the college game still continued to grow steadily around the country. This growth was much slower to reach Texas and it wasn’t until 1973 that the Texas Intercollegiate Soccer League (Men’s) was formed. SMU, which to this day is still the only top national Division I Men’s program in the State, was the first champion of this new league. It wasn’t until 1978 that a Texas college soccer player was named an All-American: Defender Greg Ryan from SMU. The next year was the first time that a Texas college soccer team finished in the end of season Top 10, again SMU. No Texas DI or DII Men’s team has ever won a national NCAA championship. Trinity University from San Antonio is the only DIII Mens program that has won a championship-in 2003. The first Women’s NCAA DI Title was awarded in 1982 and no Texas DI or DII Women’s team has ever won a national championship either. Hardin Simmons University from Abilene is the only DIII Women’s program that has won a championship-in 2010. When I first put together the master list last year, I was very surprised to see the size and breadth of college soccer in the State. a total of 137 NCAA/NAIA/NCCAA/NJCAA (soccer (56 Men’s and 81 Women’s) programs are currently active in 83 universities and JC’s in the State. These schools play in a total of 16 different conferences and divisions. It is estimated that more than 2,000 scholar athletes will compete in competitive college soccer in Texas this year. Wayland Baptist, a Plainview program that had only existed for nine years, became the first Texas program to win an NAIA Men’s National Championship. Both the Men’s and Women’s programs at Tyler Junior College won their respective NJCAA National Championships. SMU Men and Texas and Baylor Women all made playoff runs. Baylor went the furthest, advancing to the first quarterfinal in school history. The Hardin Simmons Women advanced to the NCAA Division III Final Four, before losing in the semifinal. 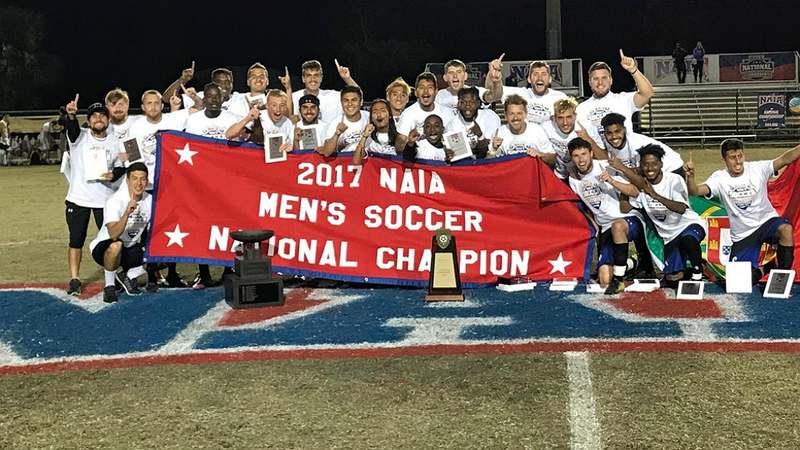 Numerous teams finished the season high in the Coaches Rankings, most notably Wichita Falls DII Men’s program, Midwestern State, who had the inglorious distinction of finishing the season with an undefeated record without a National Championship (they were eliminated in the Quarterfinals on penalties). A complete list of all Texas college programs can be found in the link below. If you are aware of other programs I have not listed or find any mistakes in this list, please let me know at jeff@txsoccerjournal.com as I am trying to keep this list current. Credit to the exhaustive work in the American Soccer History Archives for some of the historical data in this article.